One of Xiaomi's best sold phones, Redmi 5A, is finally receiving MIUI 10 Global Stable ROM with all-new features. Here's everything you need to know. 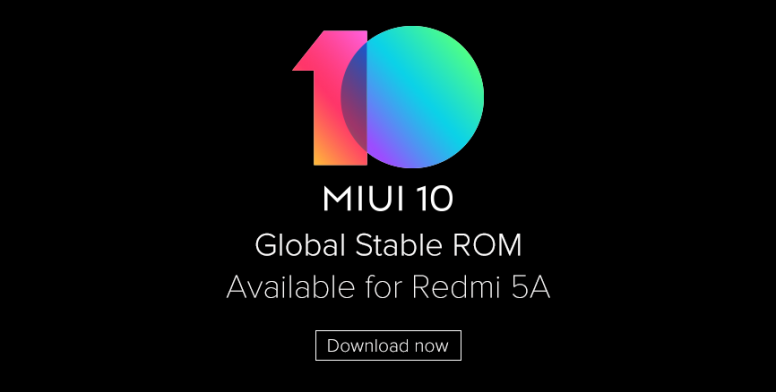 If you've been growing tired of the same old interface on your year-old Redmi 5A, you're in luck as the company just made MIUI 10 Global Stable ROM available for its users. The announcement was made on the company' official community thread, where all the details about the ROM's features and where to download are provided. The MIUI 10 Global Stable ROM update, which carries the model number V10.1.1.0.NCKMIFI, adds several new features to the Redmi 5A. As per the changelog, the update adds the latest full-screen UI, natural sound system, AI Portrait mode to single camera, and revamped system apps such as Clock and Notes. Xiaomi Redmi 5A users can head over to the Updater app and check for an OTA release or go through Settings > About Phone > System updates > Check for updates. If the OTA update isn't available, Xiaomi has shared links to download the latest firmware on the device manually. To manually update the software, Redmi 5A users must download the "Recovery ROM" from the MIUI forum. Save the file to the root directory of the phone. Go to "System update" under settings, go to the menu on the top right corner and select the update package. Wait for the ROM to install and restart the phone when prompted or wait for it to do it automatically. Xiaomi had launched the MIUI 10 in July and it has since been rolling the new software to eligible phones. While the Redmi 6-series was the first to receive the stable update, many phones have since been updated to the latest firmware. Xiaomi also confirmed a series of phones that'll be receiving MIUI 10, which included the Redmi 5A and others. #Redmi5A: best selling Android smartphone globally!#MIUI10 Global Stable ROM now available for Redmi 5A. ? Xiaomi had launched the Redmi 5A in November last year and it instantly became a hit. The handset's low price tag paired with good specs attracted consumers so much that the handset became one of the best sellers for the company. At launch, the Redmi 5A came with MIUI 9 and now customers getting MIUI 10 is a refreshment. Stay tuned for updates.